John J. 'Skip' McCarthy Jr.
4 trees planted in memory of John J. 'Skip' McCarthy Jr. Celebrating the life of John J. 'Skip' McCarthy Jr.
Obituary for John J. 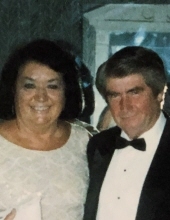 'Skip' McCarthy Jr.
John Joseph "Skip" McCarthy Jr., 91, died on Tuesday, January 29, 2019 at home in Hyde Park. sisters, Anne and Joan. He graduated Poughkeepsie High School and joined the Navy serving aboard the mighty tugboat U.S.S. Nokomis in the Pacific during World War II. After the war, he graduated from Fordham University with his pharmacy degree and on June 10, 1950 married his sweetheart, Mary Doris Regina Steeves, of Manhattan at the Church of the Sacred Hearts of Jesus and Mary in NYC. Skip and Poopsie built a home in Hyde Park and raised three boys and one girl to be fine adults. They also travelled extensively, skiing with a great group of friends and enjoying the ocean and beaches most of all. Skip owned Poughkeepsie Midtown Pharmacy on Main Street for decades and later in his career, was a pharmacist at McCarthy's Pharmacy in Stanfordville. Mary Doris died on November 9, 2004 after fifty-four years of marriage and life was never the same. His oldest son, Kevin, died on December 2, 2016 - another huge loss for our hero. Left to remember the good times are his three children, Keith (Sharon) McCarthy of White Plains and Long Beach, NY, Sean (Eileen) McCarthy of Stanfordville, and Susan (Chris) Dingee of Hyde Park. His grandchildren will miss him deeply. Seamus (Erica) McCarthy, Sinead McCarthy, Daniel McCarthy, Caitlin McCarthy and Sara Dingee all have many wonderful memories to cherish. cousin, Nancy Murphy, and many nieces and nephews. He had many wonderful caregivers in his last eighteen months, all of whom were greatly appreciated, none more than his daughter, Susan, and husband, Chris, who shouldered much of the responsibility. Special thanks to Hudson Valley Hospice and VA Hudson Valley Home Care for their professional and tender care. Calling hours will be 4 to 7 pm, Friday, February 1st at Sweet’s Funeral Home, Rte. 9, Hyde Park. A simple celebration of friendship, family and camaraderie that Skip and Poopsie so enjoyed, will be at 10 am, Saturday, February 2nd at the Funeral Home. Rev. Arlene Dawber will officiate. Burial with military honors will follow in the family plot at St. Peter’s Cemetery, Poughkeepsie. In lieu of flowers, memorial donations may be made to the Hyde Park Fire Department, 4306 Albany Post Rd., Hyde Park, NY 12538 (they responded and were kind and efficient many times this past year), or, the Hyde Park Free Library, 2 Main Street, Hyde Park, NY 12538 (www.hydeparkfreelibrary.org). To send an online condolence or for directions, please visit www.sweetsfuneralhome.com. To plant a tree in memory of John J. 'Skip' McCarthy Jr., please visit our Tribute Store. "Email Address" would like to share the life celebration of John J. 'Skip' McCarthy Jr.. Click on the "link" to go to share a favorite memory or leave a condolence message for the family.